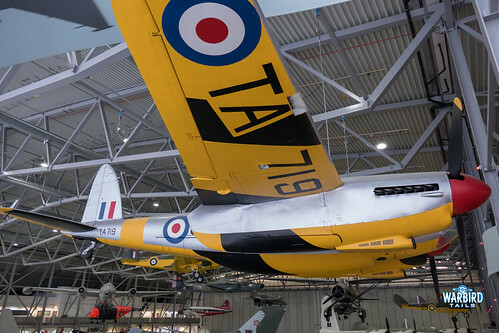 For many years now, the Imperial War Museum’s Mosquito, TA719 has hung from the ceiling in the airspace hangar at Duxford, the aircraft is painted in distinvtive target towing colours. This offers a very different representation of the Mosquito both in scheme and display. A number of the Mosquitos currently on display are TT.35 examples which carried out target towing duties post war. The scheme in question is a very striking silver topside combined with a black/yellow striped underside. Given that all of the other Mosquitos on display are wearing wartime camouflage scheme it is a refreshing change to see an airframe representing the post war colour scheme. 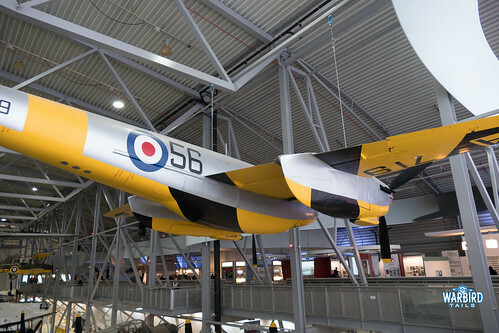 This airframe also represents the only opportunity in the UK to see a Mosquito “Wheels up” as it has been displayed in flight configuration since Airspace opened. Much like the RAF museum aircraft this machine was built in 1945 and was later converted to TT.35 status at Sywell. By 1954 the aircraft was target towing at Exeter airport. It was sold in 1963 and put on the civil register as G-ASKC. Following filming work for 633 Squadron the aircraft ended up at Staverton airport, where it was cannabalised. 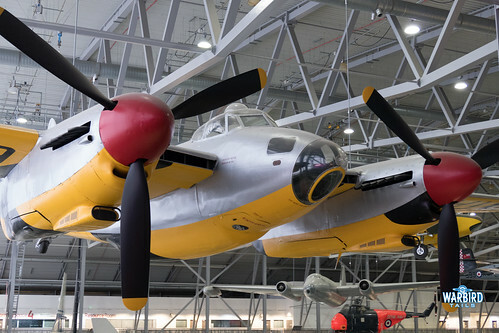 The aircraft moved into the Imperial War Museum Collection in 1978. In the early 2000s the airframe underwent further restoration work culminating in the application of the current scheme.